Horses are beautiful creatures that provide fun to people of all ages, even children. However, if you are going to bring your children around horses, it is important to properly prepare them and the horse so you can avoid potential problems. Approaching: When you first bring your child near the horse, it is important that both the child and the horse are aware of each other. Speak to your horse and your child to let them both know they are going to be approaching each other. Avoid going into your horse’s blind spot by approaching him from the side. You should touch your horse first and stroke him firmly but gently. 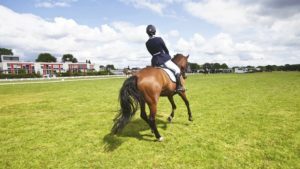 If you are going into a pasture where there are a lot of horses, you will want to watch out for potential kicks, stepping, or jostling. If this is your child’s first time, it is highly recommended to isolate your horse and child. For an extra precautionary measure, hold on to the rope of your horse so that if it is startled, you can attempt to restrain it. Petting and Riding: Once your child and the horse become more familiar with each other, the next step is to allow your child to pet and ride the horse. Treats are a good way for child and horse to become friendly but use carrots or apples in a Frisbee, plastic bowl, or bucket to prevent accidental finger bites. If your horse gets excited over the presence of snacks, a normal reaction, and it scares your child, use a bucket instead! When your child is ready to ride, you should lead the horse on a slow walk while also holding your child’s hand or back. Always dress your child in the proper safety gear: helmet, boots, kneepads, and other protective gear. The most important thing to remember when introducing your child to your horse is to stay vigilant and cautious. Communicate openly with your child on your horse’s behavior, remind them that they should have fun but also be respectful to the horse, and to always pay attention. For high quality horse insurance, trust in the experts at Ark Agency! To learn about our horse insurance plans, give us a call today at 320.243.725 or 800.328.8894!